A rendering of the new Facebook offices at 100 Binney St.
Facebook has a status update: The social network will open a new office in Cambridge next year and plans to hire more than 500 employees, bringing the staff to 650. The company, which founder Mark Zuckerberg launched at Harvard University before decamping for the West Coast, established its first Boston-area team nearly four years ago, with a small group of employees sharing a workspace. Today, that team has grown to more than 100 people in a Kendall Square office, and space is getting tight, said Ryan Mack, who leads the Facebook Boston office. The new offices will occupy the top three floors of 100 Binney St., a new building designed by Elkus Manfredi that is scheduled to open early next year. 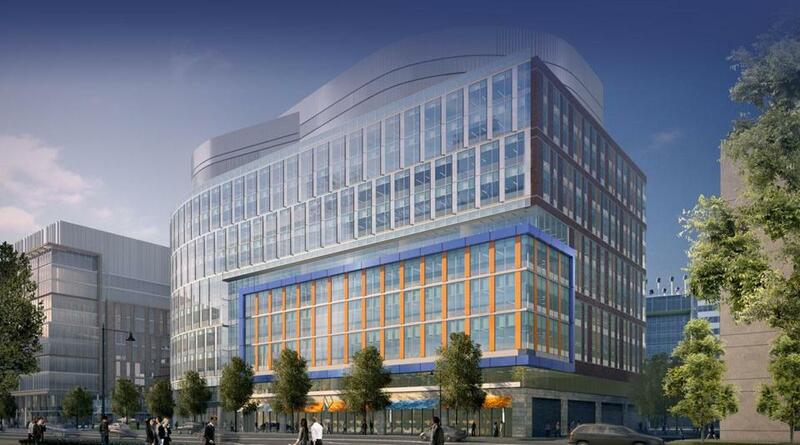 Facebook will share the space with 300 Bristol-Myers Squibb employees. “This makes them one of the largest employers in Cambridge,” said Cambridge City Councilor Nadeem Mazen. “It’s a confirmation of something we know and celebrate” about the region’s technological prowess. Mack said the new space will allow the Cambridge-based team to ramp up efforts on several fronts. The office will be a hub for the company’s machine-learning efforts, as the company attempts to understand how Facebook’s data, hardware, and software can be optimized to serve users, he said. That team has recently gotten new support from David Brooks, a computer science professor at Harvard who will be collaborating with Facebook while on sabbatical this year. Brooks has been studying how computer hardware systems are physically designed to operate and interact with software, focusing on attributes such as how battery life and temperature of devices affect how well they function. The new office also will host a “Connectivity Lab” focused on delivering technology and Internet access to the 4 billion people worldwide who currently live without the Internet. The team in Boston will be working to develop new technology and partnerships to build more efficient networks with telecom companies, Mack said, and will partner with hardware manufacturers to develop products. The news comes amid recent reports that Facebook is experimenting with hardware again after a failed attempt to create its own phone in 2013. According to a patent application filed last month, Facebook is looking to develop a gadget that operates a bit like a Lego set. The modular electromechanical device has various pieces that can be assembled and might include a speaker, GPS, microphone, touch display, and phone. There has also been speculation that Facebook is working to design interactive in-home speakers like those recently launched by Google and Amazon. Mack said he could not specify what projects are in the pipeline in Boston but said that, overall, the new office will continue to focus on mobile and data center support for Facebook’s 2 billion users. “I hope they show the leadership and commitment to do it,” he said. Janelle Nanos can be reached at janelle.nanos@globe.com.